On the cusp of the Fall and Winter seasons, we have a new show at Crunchyroll to tide you guys over until the new season! 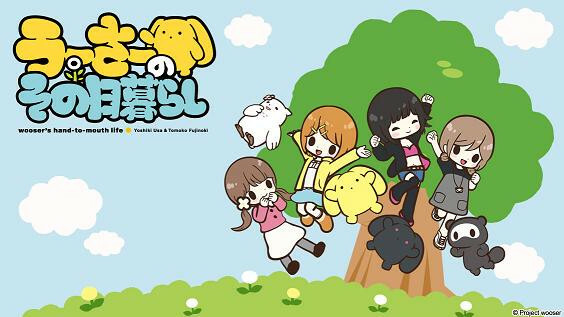 Wooser's Hand-to-Mouth Life is a colorful, wacky anime based off of a character created by a member of the music group Supercell, Yoshiki Usa, and illustrated by Tomoko Fujinoki. The premise of each short centers around the random, wacky daily life of Wooser, an cute creature that lives on the Internet. However, don't let his adorable demeanor fool you! Wooser actually has a terrible personality, and a penchant for money, meat, girls, and uniforms. Wooser's Hand-to-Mouth Life is available in ALL territories worldwide excluding Japan, and will launch with a new episode every Tuesday, at 10:00am PST. Known as "Wooser no Sono Higurashi" in Japanese, the series stars the titular character himself with Mamoru Miyano of Light Yagami fame providing the voice, along with twins Run and Ren, voiced by Minori Ozawa and Haruka Nagamune, respectively. There is also Yuu and Miho, classmates of Rin and Ren, with the former voiced by Tia, who also sang the ending theme "Love Me Gimme" composed by the leader of Supercell himself, Ryo. Check out Episode 1 right now! Wooser! I love Wooser, it's a great show, nice to see it here at CR! Just watched it. I like Poyo a lot more, but Wooser is still better than every other anime short I've seen on Crunchyroll. I look foward to next week. I had thought that maybe Crunchyroll would have gotten this earlier. Nice as always to have another worldwide except for Japan series even if it's a short anime. ᴘʀᴏғɪʟᴇ ᴛʜᴇᴍᴇ: Vkook/Taekook || sᴇᴍɪ-ʜɪᴀᴛᴜs || ɴᴏᴛ ᴀᴄᴄᴇᴘᴛɪɴɢ ʙᴜᴅᴅʏ ʀᴇǫᴜᴇsᴛs!!! I'm excited to see what contest CR will do for this series! Just watched the first episode. It's very interesting, I'm putting it in my queue. It'll help make up for the hole that was left when Yurumates 3dei ended. LoL been following it this season it's hilarious. Glad CR picked it up. Wasn't sure what to think when I first saw this added to the Crunchyroll menu, but it's pretty damn funny.